The Grumeti Reserve is located adjacent to the Western Corridor of the Serengeti, bordering the national park, and encompasses over 350,000 acres of unrivalled wilderness. The concession is privately and exclusively owned by Singita Grumeti Reserves. The Grumeti area forms part of the famous migratory route, which is travelled by hundreds of thousands of animals every year. Singita Grumeti Reserves consists of three properties: Sasakwa Lodge, Sabora Tented Camp and Faru Faru Lodge; all unique properties that celebrate this incredible landscape. Sabora Tented Camp is situated on the Serengeti plains, beautifully decorated in grand campaign 1920s style. Located on the flat Serengeti plains, the camp is designed for those who are searching for a true 'Out of Africa' experience. Sabora offers elegant simplicity and laid-back romance, with 360-degree views of the game-filled plains. The vastness of the plains creates a sense of ultimate openness and offers an invitation for guests to explore Africa in a new and meaningful way. The six lavish tents evoke the sense of rimance and adventure of a temporary safari camp, while offering every luxury you can imagine. Soft canvas separates guests from the elements and interiors are beautifully decorated with European finery, ethnically-inspired objacts and campaign furniture. Grumeti is a family friendly reserve, and mature and responsible children over the age of ten are welcome at Sabora. Twice daily scheduled flights are available from Arusha, and private charters can be arranged, all of which land at Sasakwa airstrip, located a few minutes from Sasakwa Lodge, and a comfortable drive through the Grumeti wilderness to Sabora. The long rains are from February to May and the short rains are from October to December. Being close to the equator, the temperatures are fairly consistent. June to August are the cooler months, but really only the mornings and evenings are cool, with day-time temperatures of around 22-25 degrees Celsius. June to February are probably the most popular months. Warmest month – March. Coolest months – July and August. Sabora Camp is closed for April and May. Sabora offers six tents and all are are air-conditioned and feature a bedroom and reading area, bathroom with bath and outdoor shower, viewing deck with your own Swarovski spotting scope, and a library lounge tent. The camp also has a dining room, lounge, wide viewing deck, heated plunge pool, Jacuzzi, tennis court, spa and Colonial Trading Post.  Sabora Plains Tented Camp features six luxurious tents.  All tents are en suite with bath, open air shower, dressing area with vanity table and hair dryer, electronic safe, air conditioning, overhead fan, direct dial telephone (US lines) and wireless internet access.  Each tent has a reading area and viewing deck with Swarovski spotting scope -	Each tent features a shared library tent with bar and fridge.  The living area of the camp offers a dining tent, a large airy lounge tent, and a spacious covered deck overlooking the Serengeti plains, full bar, satellite television with DVD player and Play Station, swimming pool and Jacuzzi, tennis court and Colonial Trading Post.  The tented Spa features two therapy rooms offering a range of treatments from hand and foot treatments, facials, massage and full body treatments.  Access to the Sasakwa Equestrian Centre which is home to sixteen horses which are a combination of polo ponies, part thoroughbreds and warm blooded sport horses all between 14 and 16 hands; tack is English style and both English and Western saddles are available; all Equestrian related activities are led by professional horse guides.  Morning tea, breakfast, lunch, dinner, high tea, bush snacks, game drive snacks and canapés served in a variety of venues.  Laundry and valet services.  Highly trained chefs are available to take care of any culinary needs. Please inform us of any special dietary requirements.  All beverages, fine wines, sparkling wines, selected champagnes and cognacs as well as cigarettes and cigars.  Professionally guided activities including game drives in open vehicles, walks, night drives, horse out-rides onto the plains, mountain biking and archery.  Other activities available at ones leisure are tennis, badminton, lawn croquet, and swimming.  Wireless internet access and dial direct telephone available in all tents.  Satellite television, DVD player, Play Station and an array of board games in the library.  Park and concession fees. We regret no children under the age of 10 years will be accepted, unless the whole lodge is booked on an exclusive use basis. With its enormous skies, wheat-colored plains and abundant wildlife, a visit to the Serengeti is a lifetime dream for many travelers. 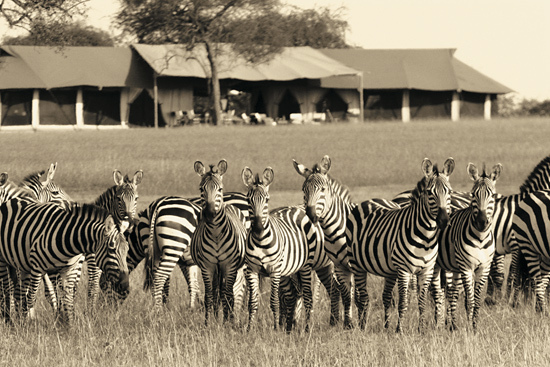 Singita Grumeti Reserves form part of the world-famous migratory route. The absence of fencing allows the migration of game between the park and the concession. The reserve is home to varying habitats including open plains, rugged rocky outcrops, woodlands and riverine forests. The Great Migration traditionally moves through Grumeti Reserves between June and August. However, there is an abundance of wildlife to be seen in Grumeti all year round, including; 400 species of birds (including five endemic species and a high concentration of raptors), 40 species of herbivores, 25 species of large carnivores and prolific plant life and plant species. Game drives and walks can be enjoyed with professional guides - the most experienced in East Africa, whilst other activities include archery, lawn croquet, badminton, billiards, star-gazing safaris, mountain biking, equestrian pursuits, and hot air ballooning. The Equestrian Centre is situated adjacent to Sasakwa Lodge, and is home to sixteen horses. The Centre includes a lunging arena, fenced paddock, and a walled 2.7 kilometre riding track, which can also be used for walking and jogging. More experienced riders can enjoy outrides onto the Serengeti plains. Tack is English style, and guests have the choice of either English or Western saddles. There are tennis courts at Sabora Tented Camp and Sasakwa Lodge with a choice of surfaces. Spa facilities are available at all three lodges. Yoga and gym facilities are available at Sasakwa Lodge. Wireless internet access and satellite television at all three lodges.  Flying time from Kilimanjaro International Airport is one and a half hours.  Flying time from Arusha is an hour and a quarter or eight hours by road transfer.  Scheduled flights with Regional Air land twice daily on the Sasakwa Airstrip.  Alternatively, a plane may be chartered into the Sasakwa Airstrip.  Should a transfer be required from Seronera Airstrip, there is an additional charge of $150 pp to allow for the Serengeti National Park Fees and the driving time is two and a half hours.  Credit Cards: Singita Grumeti Reserves do not accept Diners International, only Visa, MasterCard and American Express.  Electricity: 110 converters are available at each lodge. Power: 220 AV.  Health requirements: Yellow fever inoculations are compulsory when entering east Africa. Contact your doctor or travel clinic beforehand.  Malaria: Grumeti Reserves is a malarial zone, however, there is a spraying program. Please ensure you consult your doctor before travelling to east Africa.